When I was younger, I was always that one kid who flat out refused to wear green on Saint Patty’s day. And if you pinched me, I slapped you. When I got older, I sneered at Cinco de Mayo drinkers and wasted New Years’ Evers. Gawd, I’d think, why don’t you just celebrate when you feel like it instead of this arbitrary day just because everyone else is doing it? I don’t know if that aversion to popular events was just my stubborn, rebellious lone wolf streak, but the edge has softened over the years. But, that didn’t stop me from thinking every writer in the modern world was absolutely nuts for trying to knock out fifty-thousand words in thirty days. And everyone was talking about it, and not just in November. 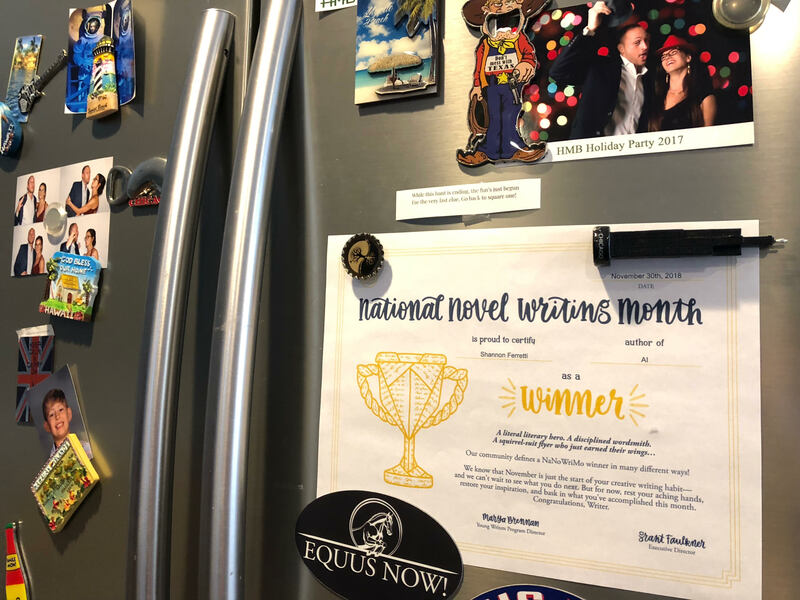 Needless to say, I did not participate the first year I became familiar with National Novel Writing Month, and I didn’t the next year either, although my unexplainably intrinsic distaste had faded. And the who’s-doing-nano tweets piled up, and the excitement and encouragement was overwhelming. I was getting excited for my friends who were preparing themselves for NaNo–and it was serious stuff. There were meal plans, novel outlines, reward baggies prefilled with candies and treats. The dedication was impressive. Que to me sitting alone at my desk, staring at the rough draft I was supposed to be almost finished with. The plan to have it written by the end of November was long abandoned. I had about 10,000 pathetic words and plenty of excuses–totally valid excuses, mind you–and my motivation to keep going was flagging. My characters were moping, poking me every now and then like a begging orphan who’s form was only half-fleshed out in my mind. And even though I was pulling every rough draft writing trick I knew out of the bag, progress was slow and faltering. So, when one of my favorite writing friends messaged me directly about NaNoWriMo absolutely spilling with contagious enthusiasm, I surprised myself by writing ‘Yes, I’ll do it!’ and hitting send without a second thought. So, naturally, I panicked. And when the panic started to fade, I had a stern talk with myself. Look, I said, you’re pantsing your first novel, you haven’t written a novel-sized rough draft in years, and you have no idea what you’re doing–no stress, just words. And I would keep writing that way until sceneage started coming out instead of self-talk. And all of a sudden, my word count started piling up. Not only did making that NaNo goal seem possible, finishing my rough draft before the end of the year didn’t sound so impossible anymore. And every time I got online, I was inundated with triumphant updates, congratulations on hitting milestones, vents about rough days and getting behind on word count, encouragement to keep going, and invitations to write in sprints together. Not only did I “win” NaNo by writing 50,000 words in thirty days, I also amped up my excitement and inspiration about my project, and even though I woke up today, this first day after NaNo’s ended, with all the intent of not writing a word and just relaxing, I found I didn’t want to. As I paced back and forth in my kitchen, I knew what was bothering me. I wanted to write. And that is what NaNoWriMo is really all about. Excellent post, Shannon. I loved it. I am not even a writer and I have been cheering everyone from the sidelines. So, to you I say, Congratulations! The marching band is just down your street and headed for your front door!